Plating Services are a range of typically metal finishing operations wherein thin layers of metallic materials are electrochemically or chemically deposited onto substrates to provide a degree of corrosion resistance, improved electrical characteristics, etc. The process can involve heat, vacuum, chemical, and electrical deposition. For industrial applications, chrome plating is often used to improve wear resistance of shafting and it is also used to restore machine parts to their original dimensions. This process is often called "hard" chrome plating. Another technique for surface restoration is nickel-chrome plating which applies a layer of chrome over a layer of nickel. Both are electrochemical processes. Electroless nickel plating does not use electricity but is instead termed an "autocatalytic" process. 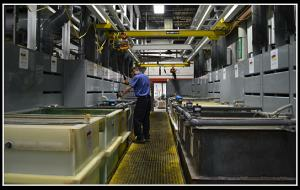 Other materials are routinely plated onto substrates, including gold, platinum, zinc, tin, etc. Sometimes plating is used for aesthetics such as in jewelry making or silverplating of utensils, but it serves many functions in the industrial sphere. Gold plating is used to improve the conductivity of some electronic connectors; zinc plating is common among everyday hardware items such as screws; and tin plating is common for food related items such as tin can packages. Plating methods include techniques such as rack plating, barrel plating, and vibratory plating. Rack plating is often used for large or fragile pieces where each item is secured to a rack. Barrel plating is commonly used for smaller parts, where parts are loosely tumbled in a barrel. Vibratory plating is used for small, delicate parts which could be damaged by barrel tumbling. Each of these methods is used for whole part plating; where selective surfaces are to be plated, such as with electronic components, reel to reel and other similar techniques are employed. Advantages: Plating Services ordinarily involve large vats of hazardous chemicals and for this reason is usually done by outside vendors. For build up applications, plating is not self-leveling and may require grinding. Many engineered coatings are self leveling. Applications: Plating Services apply to almost any situation where metals need to be hard for wear, or corrosion resistant, or repaired. Decorative effects on motorcycle parts, etc.